If you’re looking for the best family board games to invest in, you’ve come to the right place! With the cold weather upon us and the holidays looming in the not-so-distant future, I’ve been on the hunt for some indoor activities we can enjoy together as a family when it’s too cold – or we’re too lazy – to go outside. Crafting activities have always been my go-to solution to keep my daughter entertained on bad weather days, and while I love that crafts offer opportunities for her to practice her fine motor skills and that they also double as good independent activities for her to enjoy while I’m cooking, cleaning, or folding laundry, they often create a ton of mess and don’t really provide opportunities for the 3 of us to engage and have fun with one another. So, when I caught my daughter looking at family board games the last time we were at our local toy store, I had the brilliant idea of creating a family game night ritual on the weekends. We don’t own a lot of family board games! Actually, that’s not entirely true. We’ve collected a few over the years, but since our collection is pretty limited, the novelty of them wore off long ago, prompting me to start researching and testing the best family board games. Keep in mind that family game night isn’t supposed to be stressful or complicated – it just needs to be deliberate. Select a few games, grab some snacks, put your electronic devices away, and just have fun. A list of the best family board games is great and all, but many parents find it difficult to schedule quality time with their kids given all of the other things that are pulling at their attention 24/7. We live in a world where we’re encouraged to over-schedule ourselves and our children as much as possible, and while it may seem impossible to squeeze one more thing into an already hectic daily routine, I promise you it isn’t. Here are some tips that have helped me enjoy one-on-one time with my daughter each day. Come up with a weekly plan together. If you constantly find yourself feeling guilty about not getting a chance to enjoy fun activities with your kids in the evenings, on the weekends, and/or during holidays, taking the time to sit down and brainstorm ideas together can make a huge difference. Ask your child for a list of activities he or she would like to do with you, write a few of your own, and then commit to actually doing them! Schedule quality time into your daily routine. Once you have a list of activities you want to enjoy with your child, keep yourself accountable by assigning a day/time to do each of them. I suggest picking simple ideas for weekday afternoons/evenings and reserving more involved crafts and activities for weekends and holidays. Remember that this doesn’t need to be complicated. It just needs to be deliberate. A weekday activity may be as simple as testing out a new family board game, making ice cream sundaes after dinner, or brainstorming for a more exciting activity you have scheduled for the weekend. Unplug. When you’re spending quality time with your child, it’s important to be 100% present. Leave your phone and computer in another room and don’t multitask. Your child shouldn’t need to compete with anyone or anything for your attention during your one-on-one time together, and giving your child your undivided attention for 10, 15, or 20 minutes can make a huge difference in reminding him or her they are the center or your universe. Find ways to have fun while running errands and completing chores. As a busy working mom, I understand how difficult it can be to balance all of the things vying for your attention between school pick-up and bedtime, and one of the best tips I’ve learned over the years is to find ways to turn errands and chores into an opportunity to spend quality time with my daughter. Get your kids involved with cooking dinner. Turn your grocery store experience into a scavenger hunt. Have a dance party while folding laundry. You get the idea! Be more present during your morning and bedtime routines. Mornings and evenings are probably the busiest parts of my day, but experience has taught me the importance of ensuring my interactions with my daughter are positive during these times, even if I’m feeling stressed and impatient on the inside. I’m careful not to schedule client meetings close to school drop-off or pick-up, and when we’re pressed for time, I always remind myself that I’m the mom and I make the rules. I’d much rather my daughter be 10 minutes late for school or bed if it means our day starts and ends positively. Create a ritual. My daughter and I are both creatures of habit, and over the years, we’ve created certain rituals to help us connect with one another during our morning and evening routines. We have a 5-minute dance party while we’re getting dressed each day and find something fun to talk about on our walk to school, and each evening I crawl into bed with my daughter for 15 minutes so we can chat about our day, work through anything that may be troubling her, and discuss the things we have to look forward to in the coming days and weeks. Think outside the box. When it’s physically impossible to spend one-on-one time with your child (i.e. when you’re traveling for work, your child is in school, etc. ), find other ways to let your little one know you’re thinking of him or her. Leave an unexpected note in your child’s lunchbox, have someone help you organize a time to talk via FaceTime or Skype, send your little one a funny text message or a heart-felt email…you get the idea. And now for the fun part! 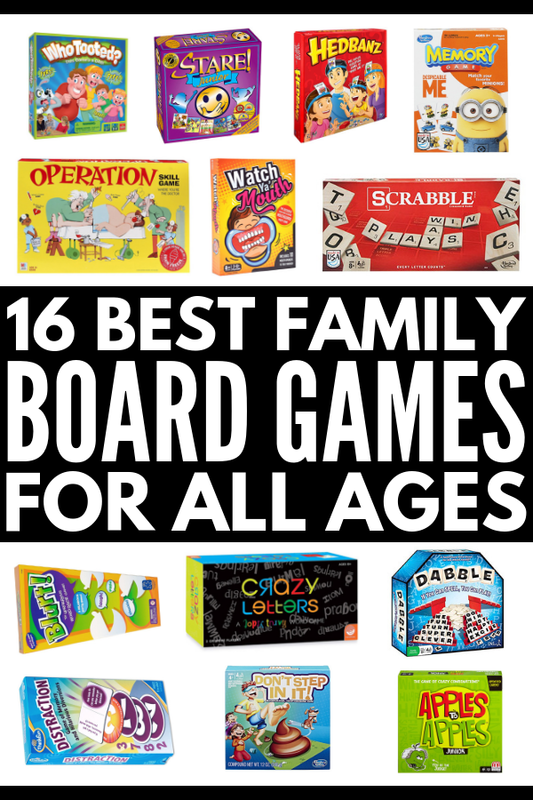 If you’re looking for the best family board games for kids and adults of all ages, here are 16 of our favorite picks of all time! If you’re looking for super fun family board games that help develop certain skills, this will challenge your child’s memory, concentration, and imagination all at the same time. Players are given 30 seconds to stare at an image on a card, and then the card is flipped over and another player asks them a series of questions about the image to see how much they can remember. It’s heaps of fun! This game is equal parts hilarious and educational, and is a great addition to family game night. Players take turns drawing number cards and must remember the growing sequence of numbers until a player pulls a ‘distraction card’. This person must then answer a silly question before reciting the sequence of numbers in the exact order they were drawn. It’s a fun way to help develop a child’s cognitive skills without them even knowing it! Geared towards older kids, Blurt! is a fun game the whole family can participate in, but it’s also a great way to teach kids self-control. The premise behind the game is simple – one person reads a definition, and the person to blurt out the corresponding word first wins – and when you organize the game such that only 2 people are playing against one another at a time, it forces the rest of the family to exercise self-control as they refrain from yelling out the answer. Also known as ‘Concentration’, there are many versions of the classic game Memory available for purchase to help develop a child’s focus and concentration skills. The idea is pretty easy and can be enjoyed with 2 or more players. Simply lie all of the tiles from the game facing downwards, and then take turns turning over 2 tiles at a time until you find a match. Children naturally build their working memory as they try to remember where specific cards are. We love our Despicable Me Memory Game, and I highly recommend Melissa & Doug’s Flip to Win Travel Memory Game as it can be played independently (or as a family) for on-the-go fun. I’m new to this game, but so far I really like it. To play, you lay out your cards and then try to find as many matches as possible. The cards are transparent and have different colored hoops on them in different positions. Players must look for matches (aka ‘swishes’), and the player to find the most wins. Swishes are created when a player can line up 2 cards such that the hoops are identical when they are stacked one on top of another. Cards can be rotated in order to make a swish, requiring players to use a variety of executive functions. In addition to exercising their visual-spatial abilities, players must focus and concentrate, and work quickly to beat their opponent, making it a great interactive game for kids and adults. Kids are very obsessed with poop these days, and while you may not be a fan of the concept, your kids will likely think this is one of the best family board games ever. I love that it can be played independently, but I think it’s safe to say your little one will enjoy this game more if you play it as a family! A friend of mine recently posted a photo of her and her family playing this game on family game night, and so many other friends of ours commented about how fun the game is that I have convinced my sweet girl to put it on her Christmas list. The idea is pretty self-explanatory – you put a funny tool in your mouth to keep your lips and jaw in a certain position, and then you have to draw cards and try to say silly phrases. It’s such a hoot! Also? There’s an adult version of Watch Ya Mouth. Tee hee. I can’t wait to try it!!!! Scrabble is a great game for kids who struggle with planning and organization. As the game progresses, they must strategize and anticipate how they can build their own words off of those already played by others. This is also a great game for kids who struggle with spelling and/or vocabulary! If you’ve never played HedBanz, you’re in for a REAL treat. Not only is this game fun, the question and answer premise behind this game will also challenge your child’s critical thinking and deductive reasoning skills. This is definitely high on my list of the best family board games to invest in! This is another great family game to help develop your child’s critical thinking skills, and it doubles as a super fun way to expand your child’s vocabulary without him or her even realizing it. To play this game, one player acts as the ‘judge’ and pulls a one-word characteristic card (i.e. goofy, cool, smelly). The other players must then look at the cards in their hands to select the one that most accurately represents this word. The judge then surveys the selected cards and decides which player wins that round. While I’m not really a fan of all of these gas- and poop-themed toys my daughter is into, they captivate her attention and I’d be lying if I said they aren’t fun. I was on the fence about this one, but it ended up being one of the best family games we’ve ever played. Go figure! Players take turns pushing the button on the game board to make sounds, and must keep a straight face when it’s their turn to push the button. It’s a great way to work on a child’s self-control skills, and will have the whole family laughing! We own a few sets of the game Operation based on different characters my daughter likes (Finding Dory, Trolls, etc. ), but I recently invested in the original game and love this set the most. If your child struggles with his or her fine motor skills, this is one of the best family board games to consider. Players take turns removing wacky ailments from the game board using a set of tweezers, and have to be careful to remove each piece with precision so as not to set off the buzzer. This is an oldie but goodie that you’ll play for years to come! This is one of the first games we bought for my daughter, and while it’s not a board game per se, I’m still including it in this list of best family board games. Perfect for kids aged 4 and up, the premise behind this game is simple but fun. Each player takes a turn rolling the die to determine how many chips he or she has to feed the pig, and each time a chip is placed into the pigs mouth, the player must push down on the pig’s head. This inflates the pig’s tummy, and it’s just a matter of time before the pig explodes. It’s so much fun and is sure to be a hit with kids and adults of all ages. If you’re looking for the best family board games that have an educational component attached, this is a great option to consider as it helps to strengthen a child’s quick-thinking skills. To play, a card is turned over and all players must race to decipher the words on the card. What’s interesting is that the words aren’t scrambled and there are no extra letters included on the playing cards. Your ability (or inability) to read the word has everything to do with where you’re sitting and how you look at the card. We really love this game! If you can spell, you can play, or so the makers of Dabble say! You’ve probably noticed I’m a fan of word games that develop things like spelling and vocabulary, which is why I’m including this in my list of the best family board games to invest in. To play, each player races to spell 5 words using their 20 tiles, and the first person to finish wins! I’ve never met a Learning Resources game or toy that has disappointed me throughout my career as a mom, and this game is no exception. It’s a memory building game designed for kids aged 5 and older, and while it’s simple enough for kids to grasp, the cards can be quite challenging. This is a game that won’t bore older kids and parents, and it’s sure to be a family hit. I hope this collection of the best family board games – and my tips and ideas to help you find ways to spend more time with your children and ensure your time together is more meaningful – prove useful to you. If you liked this collection of the best family board games, please share this post on Pinterest! And if you’re looking for more ways to have fun with your kids, please follow our Kids board where we share all kinds of great ideas we find each day!